I was off to a well deserved break after the tax men came knocking on the door that left me sleepless and restless for a time. We had to be awake by three in the morning for our early morning flight. But my blogsy friend Nina was right, we had to wait, flights don't leave earlier than six. "Finally!" 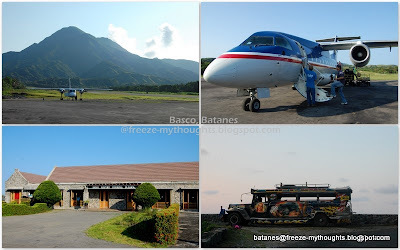 is what we blurted out when we landed in Basco, Batanes. After months of hullabaloo, we safely landed aboard the 30-seater plane of seair together with a group of 19 joining the photo safari of Mandy Navasero. See my reviews about the photo safari here. The view of Mt. Iraya and a stylish stone house airport terminal greeted us on the runway of Basco Airport. We were met at the airport by a local guide. Mang Roger is a typical Ivatan local: hardworking, hospitable and jack of all trade. He was more than just a tour guide. Aboard the jeepney, some were seated on the roof, a thrilling ride zipping on that winding road cliff of Batan. Batanes here we come! First stop was a fifteen minute spelunking in a World War III Japanese Tunnel. True to popular sayings, there's light at the end of the tunnel. As we exit the tunnel, it was our first view of the hedgerow. Hedgerow is a closely spaced shrubs that serves as barriers, protection from wind and prevents soil erosion. These hedgerow are popular in Scotland which earned Batanes the name, Scotland of the Philippines. The rest of the day was a jeepney ride to Tukon Hills overlooking Basco, a climb up the Mahatao Lighthouse, a walking tour of Basco, a sit on the rocks of Rocky Beach or Chadpidan, a wait for the sunset at Chanarian View Deck and an evening entertained by the Basco palo-palo cultural dance. With an early morning wake-up call, we're headed to Ivana port to ride the falowa. With lifevests on, we were prepared to rock with falowa as we crossed the sea to Sabtang Island. The weather was great, the waves was not as rough as I've expected. 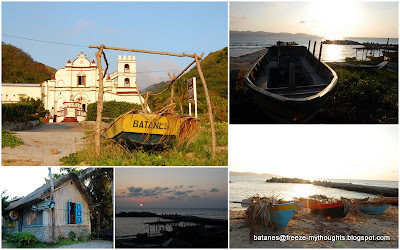 We toured the town of Savidug, had buko juice in Chavayan, had lunch in Nakanmuan’s White Beach under the famous Batanes Natural Arc, went to the Sabtang Lighthouse while waiting for our falowa ride back to Batan. 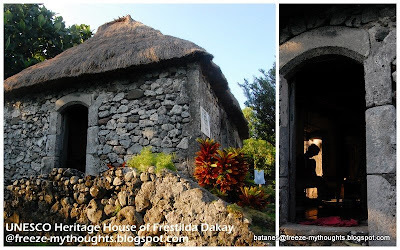 Back to Batan Island by four, we dropped by the UNESCO heritage House of Dakay built in 1600. Lola Frestilda Dakay lives in this house alone. This old lady is one of the most photographed person in Batanes. Now she's very old and weak, as much as she wants to get up and sit by the door like she did on a cover of Reader's Digest, she can only hold onto a rope atop of her bed to sit and made a gesture to welcome us inside her house. Further down in Ivana is the Ivana Church and the one of a kind Honesty Coffee Shop. It's called Honesty for the simple reason that you pay for what you buy even without someone manning the store. There's a price list on the wall, a log book to write what you bought and a box where you'll leave your money. You should bring change, it's keep the change policy here. This is something you'll only find in Batanes. It was another early day as we wanted to catch the sunrise, but we were caught offguard, our jeepney ride arrived when the sun has risen. We had breakfast instead and headed to an early morning walk at the Rolling Hills. Lo and behold, the view of the hills overlooking the sea is heavenly. It's tranquility moves the soul and breaks one into tears with a song of prayer. A moving experience felt by one during a group prayer that touched the rest of the group. Who would have thought that someone who chose to go solo on this trip, one who was exceptionally bubbly was feeling empty seven years after her husband's death, found peace on this land and so she speaks, "The Lord is my shepherd, there is nothing I shall want..."
After that enriching experience was a ride back to Tukon Hills. Fundacion Pacita Batanes Nature Lodge sits on top of Tukon Hills overlooking the sea where the Pacific Ocean meets the South China Sea. It was once the home studio of a great artist Pacita Abad who lost the battle of cancer. The place is reburbished in country style charms with rooms overlooking the sea and mountain. Rooms starts from P3,750 to 8,000. The so called Marlboro Country, was another breathtaking panoramic view, with velvet green grass and grazing cows. I could hear the sound of music playing in this windy Marlboro Hills. We had a tasty lunch in a hut but I could imagine laying down after having our picnic on a mat right on top of the hill. Wishful thinking maybe, but it's not impossible. We moved to Diura fishing village, where we started our trek up the hills to the Fountain of Youth. It's spring water with infinity pool overlooking the sea. Others took a swim while we just laze around waiting for the tides to go low. We continued to walk down by the shore, leading to Crystal Cave for a short spelunking. As we exit the tide went high instead of low. The guide must have overlooked the calendar. We had to brave the raging waters, as we head back to the village. Some didn't want to get wet but in the end, everyone got soaked. Whew, we survived with scratches here and there and a bundle of fond memories to last a lifetime. Fly via Seair from Manila to Basco Airport. 1. 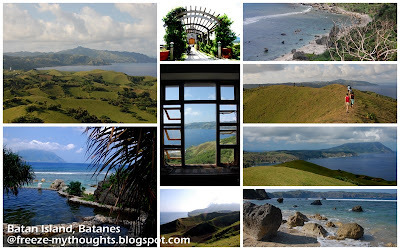 Pack a Map of Batanes by Ironwulf. 3. Discuss your itinerary with your guide, maximize travel time. 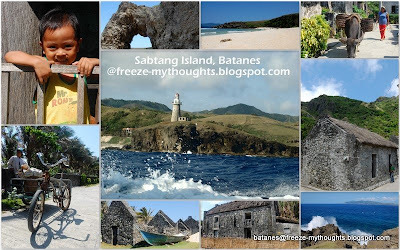 thank you for your post..i really wanted to go to Batanes...am still looking for a travel buddy. Swerte niyo naman, ang ganda ng weather! You're so lucky at calmado ang dagat during your crossing to Sabtang. nina, i guess luck is on my side this year. actually di siya ganun ka calmado but relatively speaking i think it was pretty calm. We were rocking with the falowa going the flow and sometimes against the current! 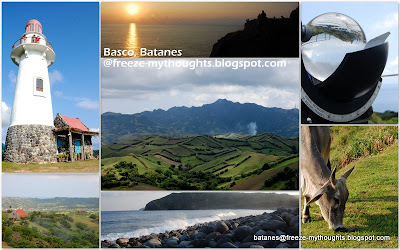 Wow I envy you :) I have always wanted to visit Batanes but I just did not have the time and money to spare. Thanks for sharing your thoughts about Batanes, ive been there once and I promise to be back, I enjoyed viewing your pictures of the place.